Butterfly gardens don't get much easier than this! This kit contains 30 perennials that will provide colorful flowers and attract butterflies for months. 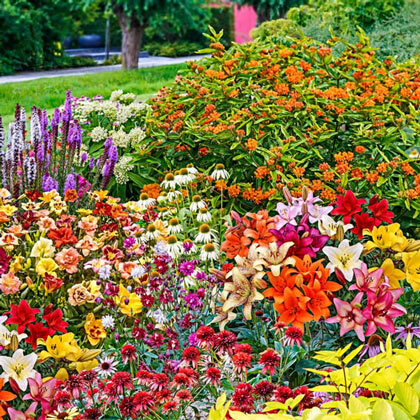 Designed to fill a 5 ft. x 8 ft. area, it includes 6 Asiatic Lilies Mixed, 12 Liatris spicata (white and purple), 3 Columbine Mix, 3 Dwarf Daylilies (red, pink and yellow), 3 Coneflowers (purple, white and yellow) and 3 Asclepias (orange and white). 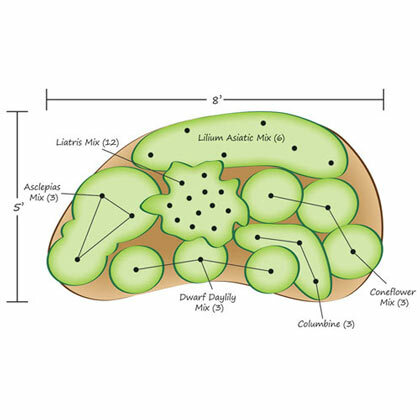 All of the perennials are easy to grow and easy to maintain. Because the perennials have different bloom times, you'll have flowers from late spring to late summer. Performs best with planted in full sun to partial shade. Zones 5-9. CommentsThis colorful perennial garden design is guaranteed to capture the attention of butterflies and hummingbirds. Giant-flowering, bright Orange Trumpet Vine is one of their all-time favorites, with flowers twice the size of regular trumpet vines. From midsummer to frost, the lavender and butterscotch spires of the Pink Lilac tempt these garden visitors with their sweet nectar. Other butterfly and hummingbird-friendly perennials complement this vine and shrub combination to create a haven of beauty in your yard.